Indian River Inlet, DE: At the April 4, 2014 meeting of the Delaware Center for the Inland Bays Board of Directors, the Board agreed to send a letter to state legislators in districts around the Inland Bays asking them to support the development of a long-term sustainable funding source for the Department of Natural Resources and Environmental Control (DNREC) to conduct sediment management, maintenance, and channel marking in the Inland Bays. The recommendation comes on the heels of the Coast Guard’s announcement that they will no longer maintain the eighteen aids to navigation in Pepper Creek and Whites Creek. 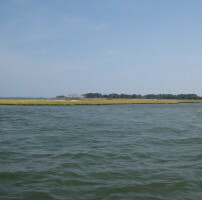 The recommendation was forwarded to the Board by its Water Use Plan Implementation Committee (WUPIC) which is responsible for evaluating and documenting the progress toward implementation of the Inland Bays Water Use Plan, and suggesting plausible strategies to ensure successful execution of the Plan. Specific requirements of the Water Use Plan include addressing waterway improvement actions. These actions focus on navigation improvements to assist boaters and other users in avoiding conflicts, improving safety, and minimizing adverse impacts to the Bays. The Committee has representation from service organizations, University of Delaware Sea Grant, DNREC, the US Coast Guard Auxiliary, and local businesses. As federal agencies continue to cut back waterway maintenance services in the Inland Bays, DNREC is left to shoulder growing maintenance costs. DNREC has estimated that $7,265,000 is needed over the next four years for planning, engineering, permitting and dredging costs in the Inland Bays, in addition to maintaining the 185 state-owned aids to navigation for which they are responsible. The Inland Bays are among the most heavily trafficked recreational waters in the state and are home to the state’s busiest public boat ramp at Massey’s Landing. There are over fifty marinas on the Inland Bays and during the peak of the tourist season more than 1,100 vessels may be on the water at one time. Over 300 thousand fishing trips are taken every year in the Inland Bays watershed and many of these are on boats. Well-marked and maintained waterways are key to maintaining boater safety and for supporting this important sector of Delaware’s coastal tourist economy.